Published on April 6, 2010 by Wade Shepard Follow me on Twitter here. RIO DULCE, Guatemala- “Hola Petra! Hola Petra!” is the call that we hear while walking down the streets here in Guatemala. If we are in a place for more than a day, the entire town has already met Petra, and they call out greetings to her whenever we pass. Petra usually kicks and coos and smiles hellos back at them. Traveling with a baby in Guatemala is good. The country of Guatemala seems to be one large baby village. Babies are everywhere in the streets, in grocery stores, sitting in the doorways of homes, on the counters of shops, around tables in restaurants. There is either an excess of babies in this country or Guatemalans really like bringing their children out in public. Babies are everywhere here. And people seem to love seeing them. Guatemala is a good country to travel with a baby. It is easy to meet people with a baby in your arms, you have an automatic in to start a conversation with a women who also has a little child on her hip — babies are something that most adults on the planet know a little about, babies are something that I now have in common with most of the world. I too, have a baby, and I am introducing her to the world. 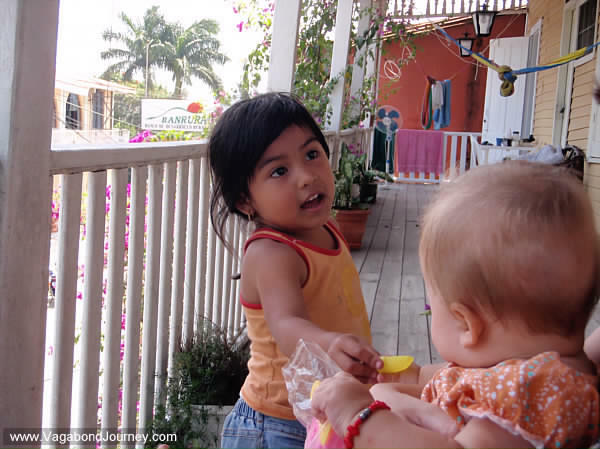 In the Dominican Republic, it seemed as if babies were kept cloistered, in doors at all costs — the people there still liked meeting Petra, but it was a very one sided interaction: their own babies were shut up behind closed doors. In Guatemala this is all different: the streets are lined with babies. And babies love seeing each other. I have no idea how Petra is able to do it, but she already has the human propensity to identify her own kind. Her kind is other babies. Their skin color, hair texture, eye shape has nothing to do with it: if a baby is in front of us, Petra identifies it as being a bird of her feather, and she kicks and waves her arms, laughs, smiles, squirms, and babble talks in all out and total excitement. And the other baby often stares, completely focused on Petra, though usually not as expressively excited. It is my impression that Petra may be a little overly social, her excitement at meeting another baby is often enough to make it go comatose. But they often become friends in passing, Petra is making friends of the Road. She holds hands with other babies, sometimes pulling their hair if they have any, the babies smile at each other, and talk some sort of squeaky baby language while grabbing at each others body parts. It feels good to watch my daughter make friends, even if they are still only babies with fish memories. Friends of the way, friends of the road, making friends in passing is part of the game of traveling. Guatemala has proven to be a good country for traveling with a baby. Strangers walk up to us often and ask if they can hold her, if Petra starts crying on a bus, someone — both women and men — will usually start playing with her to make her happy again, and if we are sitting in a restaurant and Petra starts to get bored and cranky a waitress will usually come up and take our baby from us so we can finish eating. It is fun to watch people in new places play with my baby. They will often take Petra and run over to their friends, smiling, joking, and bouncing her up and down, and showing her new things to play with. Petra enjoys the attention. Chaya enjoys the break. I think the look on my daughter’s face as she gurgles, yelps, and baby talks her way into a new culture in a new land. It is perhaps the main occupation of the baby to figure out how to adapt to its world, and Petra has adapted to traveling well. Walking the streets of Guatemala with Petra is to find a country full of smiles. Like a crowd doing the wave at a sporting event, smiles rise over the faces of the people we pass on the streets. They are not smiling at me — they could not care less about daddy or even mommy — they are smiling at the baby. By the time we arrive at the end of a street the whole place has been washed in smiles, calls of “Hola nena!” and “Que linda.” People stop in the streets to talk to us, we stop in front of houses that have babies sitting out front, our new acquaintances talk and play with Petra, and I get to ask my fool questions about anything that strikes my curiosity. Traveling with a baby has made me and my wife vastly more welcomed in the places that we travel through. We are no longer a couple of odd looking strangers to be suspicious of, but a benign family to be welcomed. I feel more welcomed as a traveler with a family. The simple act of traveling with a wife and baby has opened up many hatches that I feel may have remained closed. Having a baby gives me something that I have in common with most of the adults on the planet — irrespective of culture everybody has babies. Traveling with Petra provides a meeting point between myself, a traveler, and the people and places I travel through. It is my impression that the best way to rate a country is by how many people smile at you as you walk down the street. 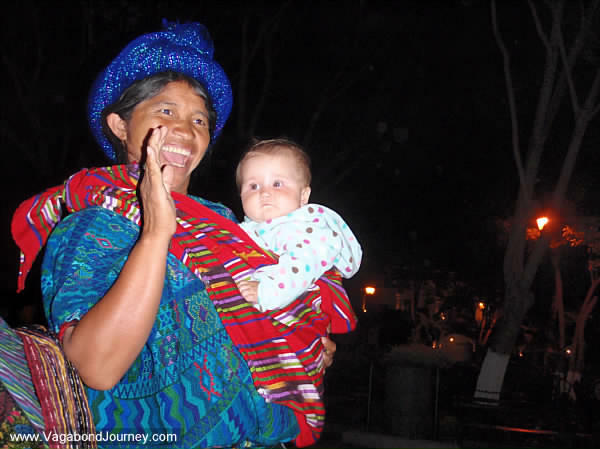 Traveling with a baby in Guatemala has raised this country into the upper tiers of the world smile index. I wanted to ask you, how do you imagine/plan the early life of your child. What are your parental dilemmas. Will you keep traveling when your child will be, say 7 – 10 yo. While travel already exposes your child to a plethora of new experiences that other children don’t have, psychologists also state the need of a stable human environment around the child (beyond parents). You probably know about the so called “third world kids” (TCK). What are your thoughts on this, if I may ask. How do you envision your traveling lifestyle in relation to the early development of your child, up to teenage years. PS: Thank you for the verizon answers. We are taking traveling with Petra as it comes. We figure that we have 5 to 8 more good years of traveling with her before we may run into difficulties. We are adapting our strategies all the time to meet her needs and she tries hard to deal with the rough parts of travel — we just rode on a bus from Rio Dulce to San Salvador for 7 hours yesterday and she did really well. As far as what the psychologists say, I must admit that I have a real difficult time placing any merit on their opinions, as they seem to change drastically every decade. Seriously, read a psychology textbook from the ’80s, it is real funny stuff now. I have know many of those labeled third culture kids, and they seem alright to me. But the ones that I have known were those who kept traveling, and probably always will travel. The problem that I find with giving much regard to what psychologists say about third culture kids is that they seem to take perpetual — or at least routine travel — itself as being a pathological sign. A life of traveling is vastly different than the base constant of a psychologist’s study sample — sedentary, regular, worker bees — and I believe that the needs and wants, the ups and downs, of someone who grows up travel are going to be different than someone who grows up in the same place. The third culture kids may have a difficult time settling down in a sedentary sort of life, but it is my opinion that an adult who was raised in a single home in a familiar community would also have psychological stresses if they all of a sudden tried to travel full time alone. What Bob says is right on: there are tons of screwed up people who came from sedentary homes, there are tons of screwed up people who were raised in all types of settings. The fact that Petra is probably going to want some solid friendships when she gets a little older is real, and we are going to need to adjust accordingly. Though I do not think that this will require us to stop traveling. There are plenty of Aidrics out there for Petra to be friends with haha. Chaya and I just need to keep finding them. Thanks for this question, it is a good one! Petra legitimizes you. I think it’s natural to put up defenses when a stranger comes around, but with Petra somehow you become normal. My wife’s brother has two children, now 16 and 15, and they were never allowed to spend the night at our house or the grandparents. To let others take their child as you allow with Petra would never happen. It’s really sad too, but they are just very paranoid and don’t take any chances. It is really amazing to watch Petra interacting with people as we travel. I think it is really good for her to meet others, hear new languages, and get out in the world and be held by people who are not her parents. I think that both Petra and Chaya and I would miss out if we kept her away from other people. Right on about how Petra legitimizes us and makes us seem more normal. It is normal in this world for adults to have families, and having a child ourselves seems to make people regard us on more of an even plane. You have an amazing life, Wade. And Petra will too. What a past she will have! Full of experiences and inspiration. I think of the slideshows people have on their 21st birthdays. Most baby photos are of them stuffed somewhere in a blanket in a little room. A lot of them having a photo with a TV show character as their most extreme photo. Look at what you’ve provided for Petra. She’s being held by amazing people with different cultures, maybe giving them a memory. You’ve literally given her the world. And its so good to see! Really hope Petra sees it this way when she becomes an adult haha. I think the earth is pretty stable. A person that grows up in the same house all their life can have a pretty unstable environment if the parents are always worried about money, losing the house, family troubles etc. A person that grows up moving a lot, or even travelling, can have a pretty stable environment if the parents make it so. Yes, there is a need for longer term friends as kids get older. I would think this could be done, although it could be difficult. I think one of the hardest things will be to find others that Petra can relate to as she grows up. What will she talk about when she meets kids that have never ventured far from thier TV? I would guess she will relate more with grown ups, and travellers than she will with most other kids her age. But I also think she will likely be great at making friends and being a good friend. She will also likely be better at making good friend choices, and less likely to attach herself to some group of “cool” friends who will get her in trouble. But then with kids, you never know….Some of the most screwed up people come from the most stable environments and some of the greatest people come from screwed up environments. Good point here, Bob: The world IS a stable place. I agree that a person can have just as much of a stable upbringing and life traveling than having a steady home. It just requires a shift in values. Humans were migratory for 90 percent of their existence, so it is my impression that traveling blends in well with our current psyches. I believe firmly that the sedentarization of humans is where a lot of psychological pathologies set in — such as depression, addiction, status mongering. The human mind craves stimulation, and it os going to find it in some form — for better or worse. It is my experience that the stimulation of traveling ideally fills the void that my mind craves. I feel good, I am happy, my wife is happy, and I hope for my daughter to feel the same. Though we will need to work maybe trying to find other traveling families to partner up with sometimes. As much as I enjoy my misanthropic tendencies, communities are good for a family to have. Though we will need to work maybe trying to find other traveling families to partner up with sometimes. As much as I enjoy my misanthropic tendencies, communities are good for a family to have. — I think that’s the crux of it right there. Humans have been nomadic for most of history, but they traveled within tribal units or clans. A group of only 3 individuals traveling would have been very strange and probably would have invited attack and death by a larger more powerful social unit. As such traveling nomads of past times did have stable relationships and friends. I think you and the psychologists are spot on. Depriving a child of stable friendships will exact a heavy psychic toll, but travel and stability doesn’t have to be mutually exclusive. Your job will be to form a modern day tribe you can travel with, one that will meet Petra’s developmental needs. Hi, its so neat to see this blog! I have a friend who is traveling to Guatemala next week and is wondering about taking baby food with her. Did you take baby food when you went? If so, did you have to pay duty on it? Was it a problem in anyway to take it? Thanks! No, we never really used baby food. I think we bought it once or twice as a treat for Petra, but never relied on it at all. But baby food is readily available in Guatemala, it would be silly to pack it from abroad. We did a think called “baby led feeding” or something like that where as soon as Petra wanted food we would just let her take it from our plates. We would break it into small pieces and let her chew it. If a piece was too big she would just spit it out. We carried a hang cranked blender with us but seldom used it, Petra proved to be able to just eat pieces of our food from around 7 or 8 months on. 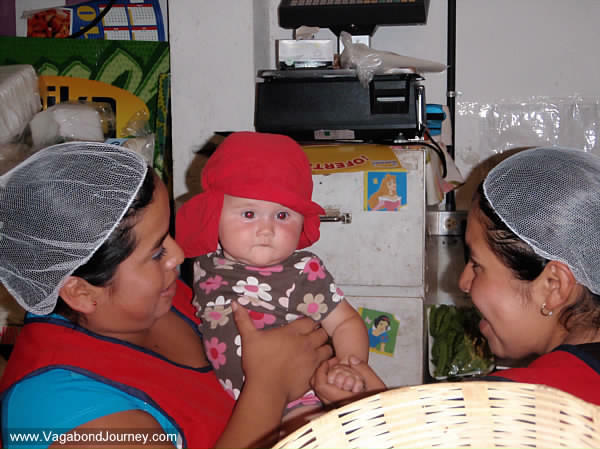 I am happy to hear positive things about travel with a baby in Guatemala & thoughts on taking a small child everywhere as my husband & I are taking our what will be 8mo old there. Our last trip there was without child in 2009. I brought my baby to Mexico from Canada at not even 2mo old to live here for a year or so(my husband is Mexican). I hardly know Spanish, but my husband does at least. Everyone thought I was crazy (even my doctor in Canada who I am not returning to). Am nervous about the long trip (12hours there) how will the baby be? happy to hear about the success on a long bus ride,we are going to be driving which may be easier for stopping. Please write more. Traveling with a kid is great. People really open up to you. A great way to travel. We found that when Petra was a baby she mostly just slept and breast fed when on long journeys. Babies seem made for travel. Hi! How old was Petra when you took her to Guatemala?? I am taking my daughter who just turned 1 year old to Guatemala City at the end of May we will be there for 2 months. My friends and family have started scaring me into thinking that I am endangering MY child! Did you have any concerns or do anything before you left the States to prepare her for Guatemala. My daughter is getting her Hep A shots early. She is used to traveling and Im pretty sure she actually likes it. babies just seem to adapt to new places easily. Anyways I would love thoughts or advice on anything before we head off!! Guatemala was not the first foreign country we went to with Petra. We began traveling with her when she was two months old, leaving the USA when she was five months old. But, to answer you questions, she was around seven or eight months the fist time we when to Guatemala with her. People are afraid of what they know nothing about, so heeding your family’s advice would be foolish. In terms of advice, all I can say is don’t over do it. 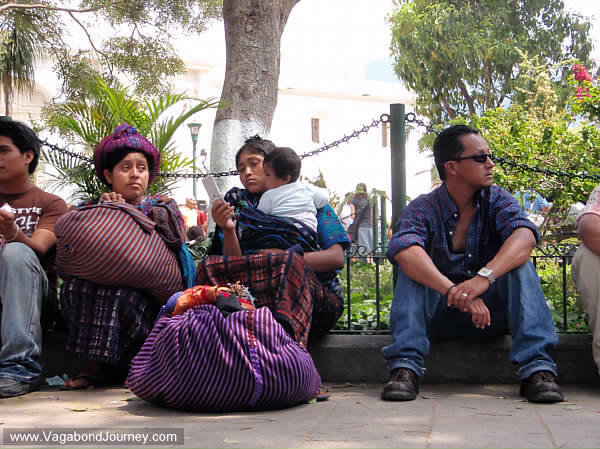 Calm down, relax, once you get to Guatemala what you are doing won’t seem very crazy at all. So, on the heels of this advice, I say don’t prepare for traveling with your child anymore than you do normally. 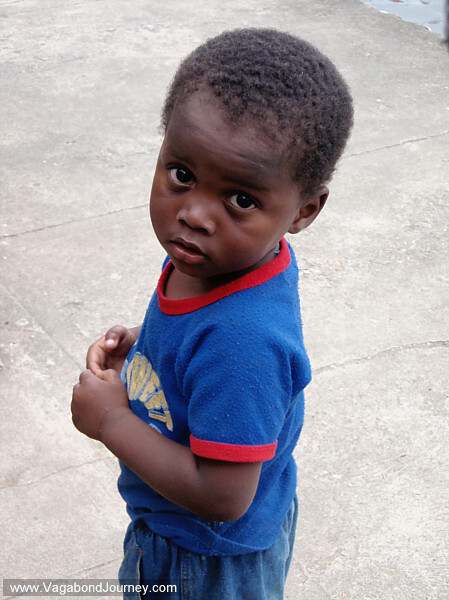 The needs of a kid are always the same no matter where you are, and everywhere in the world there are kids. In point, in terms of getting what you need abroad, provisioning a child is amongst the easiest things to do. Almost everything for a kid that is available in the USA is available in Guatemala. Though I must ask this question: Why are you going to Guatemala City? It is probably one of the most gutted, unlively cities I have ever been too. If you are not going there for a specific reason, I would highly suggest going out and getting a $100 a month house in Panajachel on Lake Atitlan or settling in Flores, on the Rio Dulce, or Xela, or even Antigua. Guatemala is full of truly beautiful places, but the capital is not one of them. Thank you so much for your article above. It seems our little ones are probably only a few months apart. Like you, we have not been afraid to travel the globe with our little one, so I am not worried about the travel or the adjusting part of it all. Rather I am looking to see recommendations on what to do with our 2 year old. We will be going to Lake Peten Itza in a few months and I can’t seem to find many websites with advice on that area. We frequently travel with our backpack so that we can take him on hikes, etc. Do you know anything about this area? Kuddos to you as well for traveling with a baby. We have people tell us we are crazy all of the time. It is definitely an adjustment to traveling, but is a good adjustment. He is literally one of the most social little guys I know! We usually travel locally on foot with Petra now, as taking buses/ taxis has become pretty annoying (she pukes). We sort of avoid tours or anything with a schedule as well, so I’m probably not the best person to ask about things to do. Other than that, Petra just sort of does everything that my wife and I do, albeit a little slower and with a lot more distractions/ unanticipated turns in the path. Have fun! So glad we cam across your post. We are headed to Guatemala with our soon to be 8 month old for three weeks. Just wondering what you did for travelling from city to city with Petra….did you bring your own car seat? No car seat. We usually just rode the bus.